The story of how one woman's letter to a Lutheran pastor in Hollywood changed the lives of thousands of people. Some time in 2006, a woman sent a letter to Pastor Mark Rasbach of Hope Lutheran Church in Hollywood, California. She was in prison, and asked Pastor Mark for something to read. He sent her a Bible. But he didn't just send her any Bible. He sent her a Recovery Bible, which uses the Bible to guide people through the 12 Steps of Alcoholics Anonymous and other groups. She read the Bible, and started turning her life around. Other people in prison started noticing, and started sending letters to Pastor Mark and Hope Lutheran. The members of Hope Lutheran were soon overwhelmed. Pastor Mark told this to a friend of his, Greg Hoenes, who is pastor of another church, Santa Clarita Seventh-day Adventist Church. Pastor Greg and the members of his church stepped up to the plate, and started sending out Bibles as well. 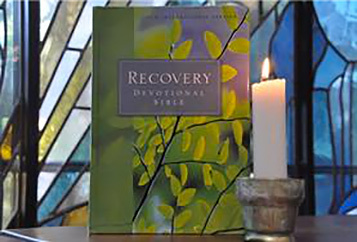 To date, the two churches have collectively sent over 2,000 Recovery Bibles to people in prison. Strictly in response to requests. News of this has spread entirely by word of mouth. Neither church has ever advertised its program.